Ryanair reports a record 13% rise in full-year profits but warns that higher airport charges means it's downhill from now. Love it or loathe it, Ryanair is clearly doing something right. Passenger traffic grew 5% to 79.3 million in the last year, helping push the budget airline’s annual pre-tax profits up a whopping 13% to €569m. Dublin-based Ryanair, spearheaded by the outspoken Michael O’Leary, also boosted revenues by 13% to €4.8bn (£4.1bn) in the year to March. More than 200 new routes were added to its roster, bringing the total to 1,600, and Ryanair will add another 200 routes and seven new bases this summer in places such as Maastricht and Marrakech, continuing its relentless march across Europe and into North Africa. This should help traffic to grow by another 2 million passengers to 81.5 million in the current year, Ryanair expects. But the announcement came with a warning that things can only go down from here. Heavy costs are weighing on the airline, and will slow its profit growth over the next year, Ryanair said. Fuel costs have risen by €290m over the last year, and now represent 45% of total costs. Unit costs have also risen 3% due to ‘excessive and unjustified increases’ in Italian and Eurocontrol air traffic control fees, and Spanish airport charges, it said. This will take its toll on the airline’s fortunes in the coming year. 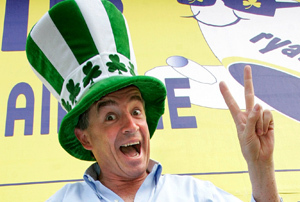 ‘With almost zero yield visibility into (the second half) and the EU-wide recession, we expect that there will continue to be downward pressure on yields which will dampen full-year profit growth,’ chief executive Michael O’Leary said, in uncharacteristically jargon-heavy form. So where did growth come from? Ryanair's average fares rose by 6% over the year. But the biggest revenue-earner came from a 20% jump in sales of additional services such as reserved seating, which brought in €1.06bn - or 22% of total revenue.